We are indulged in offering range of best Quantum 107 Adhesives. This adhesive is best in working and can be availed from our firm in many packing size. 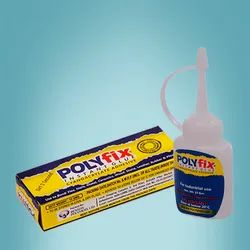 Provided to the customers in leak proof packing, this adhesive has extreme adhesiveness. Best in quality, this product show quick sticking of the implemented surfaces. Discription:- STEELFAST is a very fast hardening steel-filled HY-POXY, that is widely used for emergency repairs. This product is not recommended for constant immersion or exposure to water, but for such repairs the H-120 can be used to over come the emergency and then be covered with HY-POXY STEELBOND. STEELFAST also is recommended for repairs at low temperatures.